We’ve completed the promotion film for Realeyes, giving an overview of features and benefits on offer. As part of the brief the client required a time-freeze effect that we’d previously achieved on SkyLife. 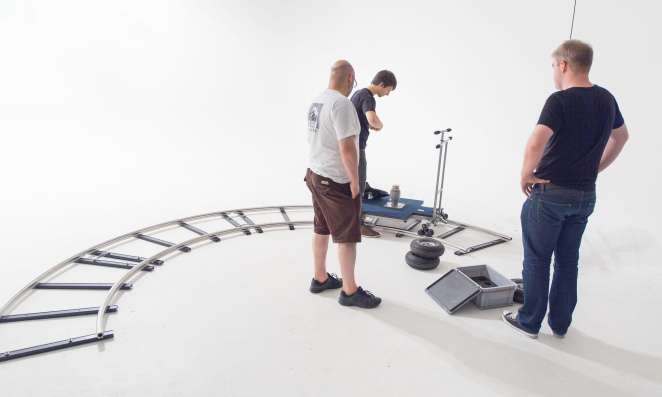 This time, however we elected to use a 180 degree dolly from the great guys at FilmScape. This, paired with the Canon 5D MK3 running Magic Lantern with the 14bit RAW video module and a Canon 85mm 1.2 L and we were all tooled up for the shoot. The client managed to secure a lovely location in South Kensington with large bright windows in the main living area. We turned up for a recce, capturing reference imagery and measuring the room and windows. We got a rough idea of the shot layout and returned to the studio to mockup some pre-vis to ensure we got the right framing and that the large 180 degree dolly track would fit into the room. The shoot day went very smoothly in no small part because of the pre-vis work and we captured the 14bit raw dng sequences to some very toasty 1000x compact flash cards that could just about handle the 90MB/s datarate. We walked away with ~350GB of rushes and started the selection process. We prepped the footage for post-production, match-moved the plates and started creating the graphic elements to the time-freeze. Thankfully the tools we were using, mainly After Effects and Lightwave 3D, played very nice together and copying over animation and assets was a smooth process. The camera was matched in After Effects and Lightwave 3D and the elements divied up depending on there complexity. We produced a smaller secondary shoot to get more granular on the details of the Realeye software and tools. Again, shot with the Canon 5D MK3 with RAW and similar 50-135mm focal length with wide apertures. Also taking advantage of the Panasonic Lumix GH4 shooting in Cinema 4K for a digital zoom on the end ‘tv presentation’ shot.